My Dog Found Five Bucks! 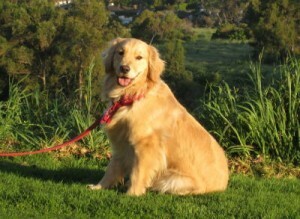 Callie, now a fourteen-month-old Golden Retriever, but still a puppy in many ways, works very hard at the "leave it" command. This command is not just intended to get her to "let go" of something. If you're quick enough on the draw, you can use the "leave it" command to keep her from picking something up in the first place. I'm really more interested in building my dog relationship with Callie than in beating commands into her, but "leave it" is important. It can be a lifesaver. On our morning jog, a Golden Retriever has many temptations. There are some good things to be retrieved -- like sticks and pine cones. But there are also some things better not retrieved -- mostly stuff that occasionally flies out of a car window. Like a candy wrapper, a sales slip, or a packing peanut. Since some of Callie's jogging is on a golf course, she's also tempted frequently by a grass divot -- a hunk of grass and dirt that got gouged out of the golf course by a swinging golf club. She's pretty good at "leave it," if we see an offending piece of trash and yell "leave it" before Callie gets to it. But, much as we try to avoid this stuff, Callie still gets the jump on us sometimes. Occasionally, she sees some scrumptious looking piece of garbage before we do, and she's learned to make a quick stab before we can react. So, we've also gotten pretty good at prying her mouth open and reaching way down into her throat to eliminate the hazard. On Friday, she totally beat us to the "trash" with a lightning fast stab before anyone could utter the words "leave it!" But imagine our surprise when we reached down to the bottom of her throat and pulled out a nice, crisp five dollar bill! Who would have guessed? How would you train a dog to only retrieve paper currency? Are there any one-hundred-percent indestructible dog toys that we can buy for five bucks? BTW, "My Doggie Says... 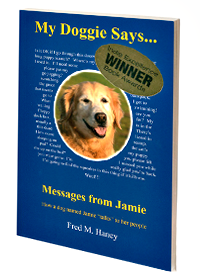 Messages from Jamie, the dog book I wrote about Callie's predecessor, Jamie, just won its fourth award -- a Silver Medal for non-fiction (Adult Books) in the Mom's Choice Awards. There's a nice review on their web site. This entry was posted on Monday, March 24th, 2008 at 11:40 pm	and is filed under Zovirax prescription, Is lisinopril a beta blocker, Augmentin 875, Buy lyrica online uk, Propecia cost, Zithromax 500mg. You can follow any responses to this entry through the RSS 2.0 feed. Both comments and pings are currently closed.